With the increased discussion and political interest surrounding Mormonism, this is an excellent opportunity to share with your friends the differences between Mormonism and Christianity. I found this article from Sean McDowell insightful, it was originally published in the Biola Magazine, Summer Edition, 2012 and is used with their permission. The author is Sean McDowell, the head of the Bible Department at Capistrano Valley Christian Schools. You can find him online at seanmcdowell.org. 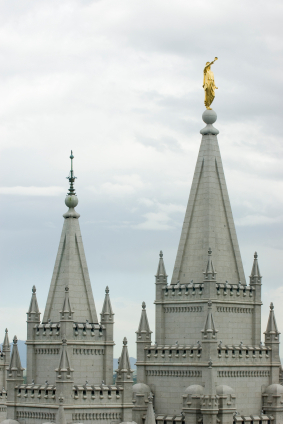 What are the Key Differences Between Mormonism and Christianity? Mormonism is everywhere. The Republican nominee for president is a Mormon, there is a play on Broadway about the Book of Mormon and the LDS Church has launched a multimillion-dollar ad campaign called “I’m a Mormon.” In light of the recent interest in Mormonism, it will be helpful to compare and contrast some of the key differences between Mormonism and Christianity. Mormonism puts a heavy burden of works on its followers. Although there are some passages that talk about grace and free salvation (2 Nephi 31:19; 1 Nephi 2:4; Mosiah 26:40), the overwhelming emphasis in the Mormon scriptures is on earning salvation through obedience to commandments and refraining from sin. For example, Alma 5:27 says, “Have ye walked, keeping yourselves blameless before God? Could ye say, if ye were called to die at this time, within yourselves, that ye have been sufficiently humble?” The next passage says you must be entirely stripped of pride or you cannot meet God. Moroni 10:32 says, “Yea, come unto Christ, and be perfected in him, and deny yourselves of all ungodliness; and if ye shall deny yourselves of all ungodliness, and love God with all your might, mind, and strength, then is his grace sufficient for you.” God may have provided an opportunity for salvation through the death of Jesus, according to Mormonism, but you have to keep all the commandments and follow all the ordinances to reach the highest level of heaven. The onus is on you. This seems in sharp contrast to the grace-filled message of the Bible (Eph. 2:8–10; Titus 3:5; John 6:29) where works stem naturally from a recognition that we have been saved. The view of faith in the Mormon scriptures differs from the Bible. Alma 32:17 says, “Yea,there are many who do say: If thou wilt show unto us a sign from heaven, then we shall know of a surety; then we shall believe. Now I ask, is this faith? Behold, I say unto you, Nay; for if a man knoweth a thing he hath no cause to believe,for he knoweth it.” In other words, faith involves believing something we do not know.If we knew it, there would be no need for faith. But the Bible proposes a different relationship between faith and reason. Knowledge is not the opposite of belief, as the Mormon scriptures suggest. Rather, the Bible presents a view of faith that is based upon what we do know. Jesus healed the paralytic so the people would know that he has the authority of God (Mark 2:10). As Biola professor J.P. Moreland often says, faith involves trusting what we have reason to believe is true. I suspect the reason the Book of Mormon has this view of faith and knowledge is that the Mormons’ claims cannot be investigated. The cities mentioned in the Book of Mormon have not been located (i.e. Zarahemla), the gold plates cannot be examined and Book of Mormon “historical sites” cannot be excavated in the same way biblical sites can be. When there is no convincing external evidence corroborating a belief, it must be based upon experience, feeling and blind faith. This may be the view of faith in the Book of Mormon, but it is decidedly not the biblical view (see John 20:30–31). ▶ There is no original sin. The Articles of Faith 2 says, “We believe that men will be punished for their own sins, and not for Adam’s transgression.” This is in contrast to Romans 5, which says death came to all through one man’s sin. This raises the troubling question for Mormons of why Jesus even had to die. Much more could be said about salvation, heaven, the Trinity, revelation and the person of Christ. But this should suffice to make the point that, although Christians and Mormons use the same words such as grace, faith, God and sin, they mean very different things by them.